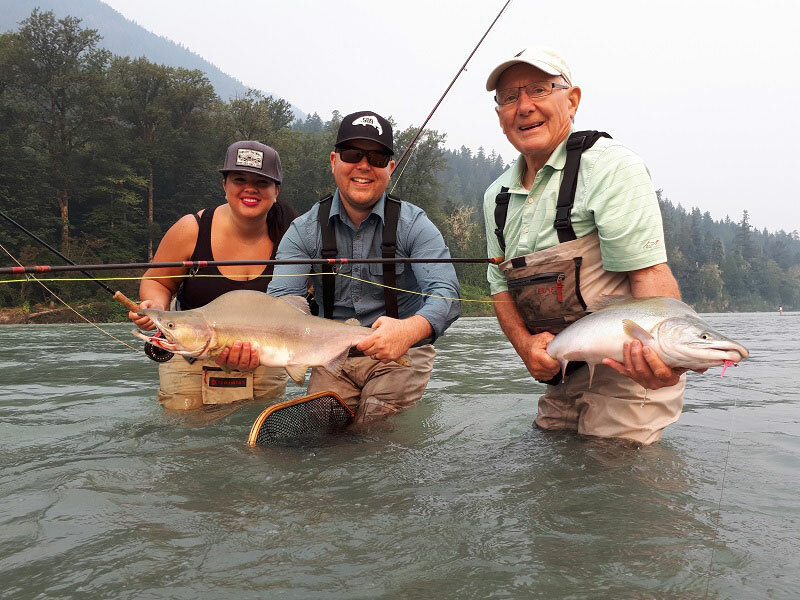 Silversides Fishing has been providing guided fishing in the Vancouver, BC area for Salmon, Trout & Steelhead on the fly plus our popular ‘bucket list’ Big Game Sturgeon fishing on the famous Fraser River since 1996. These giant dinosaurs have a world famous reputation for putting up battles that rival any game fish on the planet. White Sturgeon attributes include tail walking jumps, runs of over 300 yards plus insane stamina and brute strength. Expect to catch fish in the 5 to 8 foot range (75 – 300lbs) on any given day. True river monsters of 1,000lbs are in the river every season! 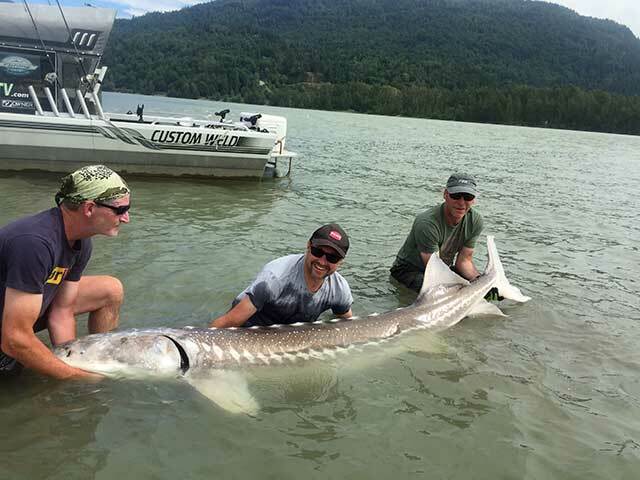 Best time for Fraser River White Sturgeon is late March thru mid-November. Our Salmon fly fishing is available from July 10 to November 30. 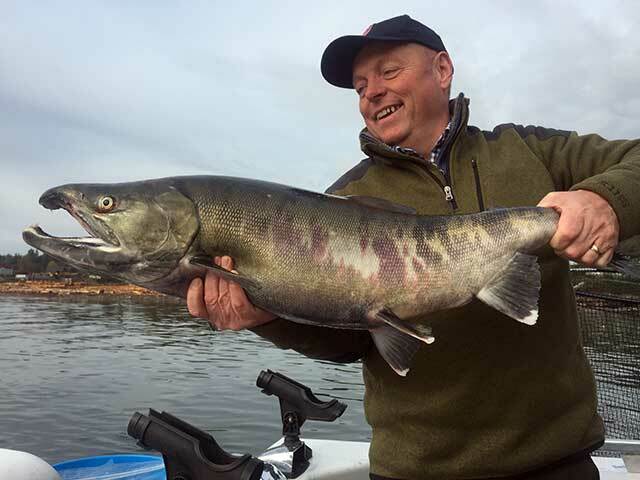 We target Pink, Chinook, Coho and Chum on our best rivers. Steelhead fly fishing is available in March & April. Bull Trout, Rainbow & Cutthroat fly fishing is available March – July and November/December. Please call us at 604.864.5445 to arrange your trip. 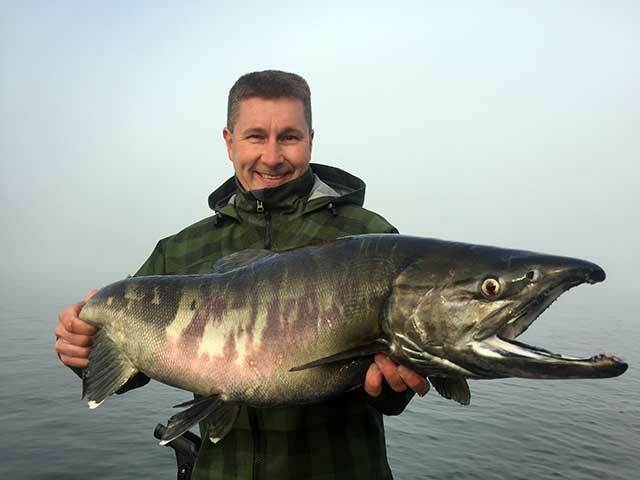 Silversides Fishing provides guided fishing in Vancouver, British Columbia at a truly professional level! We are government licensed and insured. Join our list of worldwide anglers who catch the fish of their life in this world class fishery. Our clients consistently rate our service and quality of fishing with 5 Star reviews on Trip Advisor. Owner Brian Mack has over 30 years of experience and runs the business to meet the highest standards for service and results. All our guides have a huge amount of experience fishing the local waters and are very friendly. Anglers from all over the world stay and fish with us every year and experience the best fishing they’ve ever had. What we provide is a fishing package that you can customize to stay from 1 to 14 days. All you have to do is tell us how many days you want to fish, and check-in and checkout dates, and we’ll take care of the reservations at our attractive discount rates. You take care of the flights. Airport and daily transfers are optional extras if you don’t want to rent a car. Fly into Vancouver or Abbotsford, BC.